At the heart of marketing lies one seemingly elusive goal: how can we actually get people to love our stuff as much as we do? Thankfully, there’s a surprisingly simple answer, and it lies in how we come up with our products and services in the first place. 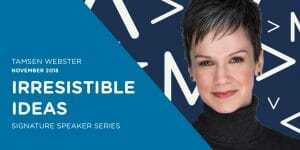 Tamsen Webster spent 20 years making messages to move minds and markets and four years turning ideas into action as the Executive Producer of one of the largest TEDx events in the world.